Movement is a foot worldwide to bring new intelligence to conventional or ‘dumb’ generation. The gas turbine microgrid is central to this smartening of power generation. The term dumb generation describes the kind of conventional power plants, wind turbines or solar panels that have been used for decades. They produce megawatts, but do nothing more. In contrast, intelligent generation systems not only produce megawatts, but also determine how and when to apply the megawatts to achieve a specific effect. The generators gain this intelligence via software controllers. Such intelligence is at the heart of the contemporary microgrid. It offers a way to derive maximum efficiency and cost savings from energy production while lowering emissions. 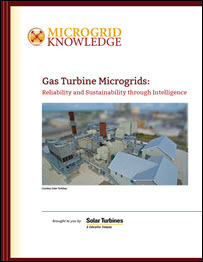 In this guide, “The Gas Turbine Microgrid: Reliability and Sustainability through Intelligence,” we look at several ways gas turbines contribute to the intelligent functioning of microgrids. We describe how they act as the backbone or anchor for system efficiency, particularly when paired with renewable energy. We feature real world examples of gas turbine microgrids in North America, Europe and Australia.